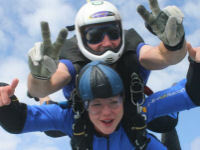 Experience the rush of falling through the sky at 120 mph doing a tandem skydive. Join us for the time of your life! Are you ready for the thrill of your life? 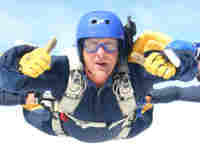 After a 30 minute briefing you will be climbing aboard the skydiving plane and flying up to 14,000 feet for the jump. 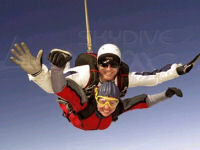 Instructor will deploy; fly and land your parachute so you just have to enjoy! Skydive from 2 miles high! 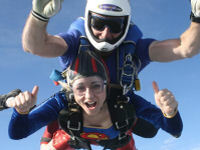 Less than 60 minutes from our Capital, this offers a unique perspective of the Southern Cotswolds and you will have an unforgettable skydiving experience with a highly experienced instructor. 1 hour, with 10 minutes in the air. After a short pre-jump briefing you will experience the thrill of freefall (up to 120mph) and even learn the basics of steering and landing a modern gliding parachute, while securely attached to your instructor. 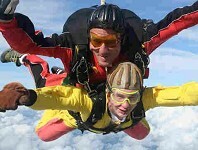 Tandem Skydive from 2 miles high! Securely harnessed to your instructor you will be in freefall for 50 seconds with speeds in excess of 120mph then instructor deploys the parachute and then enjoy a 7 minute canopy ride back to the ground.